Home Arthur Lopez Is “Creating Unity in the Community with Drum Circles™” by creating interactive fun-filled rhythm engaging events that use Drums and other Percussion instruments to foster Communication, Cooperation, Collaboration and Unity in the Community. ABOUT DRUM YOUR DREAM Drum Your Dream is about providing an uplifting, attention-getting, drumming experience for everyone to enjoy, regardless of their musical abilities or age. We provide quality rhythm based events for multi-generation groups in Communities, Education, Health and Corporate workplace environments. Get the overview of what we do here. CORPORATE DRUM CIRCLES TEAM BUILDING We provide a Professionally Facilitated Fun Filled Energizing Revitalizing Rhythm Engaging Interactive Ice Breaking Drum Circle with your employees at your Conferences and Seminars. Team Building Drum Circles can be extremely effective for companies that want to enhance the generation of new ideas and better team work. When people discover that they can collectively produce a good sound without any musical training or background, they start to realize that they can be more effective at work by putting their heads together and working as a team. Corporate-Wellness-Programs Corporations looking to enhance employee wellness to reap the benefits of extra productivity should consider how group drumming boost morale, create team spirit and favorably impacts your bottom line. SPECIAL NEEDS DRUMMING They are special in more ways than you can imagine. Integrating drumming into a classroom for special needs students can be a beneficial way for therapists, teachers and students to connect on a level that helps improve communication, collaboration and increase cognition and attention within a regular classroom. This is new and exciting way to communicate with these children/adults that can make a huge difference in the learning and social experiences they face. HEALTH DRUMMING Creating community music experiences to promote health and wellness is a shared goal across a range of professions, from music therapists to recreational music makers. ‘Health drumming” or music making for wellness is something that everyone can enjoy, regardless of age, gender, and abilities. FESTIVALS and PARKS A Drum Circle is a great addition to a festival or park event. This multi-generational activity where everyone is included and no one is excluded from sharing their rhythm spirit in joining in a fun-filled professionally facilitated drumming experience. HAND DRUM LESSONS I provide private hand drum lessons, at my studio or your home, in the Hampton Roads/Tidewater area for your enjoyment on djembes, congas, cajons and bongos. WEDDING DRUM CIRCLES Is a wonderful way of celebrating your special day with family and friends in an unforgettable unique way that gets both sides of the family, Bride and Groom, to connect with each other right away. 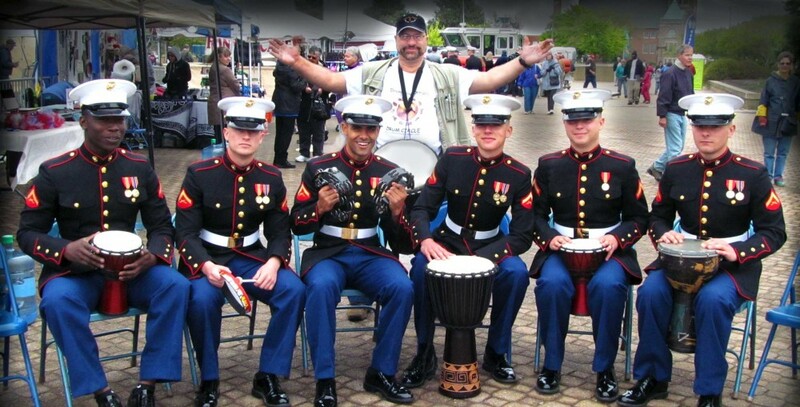 Creating Unity in the Community with Drum Circles™ We are all born with a heart beat that sends out our pulse to the World. When we all listen to our hearts we can all come together and begin to synchronize with everyone around us and even the universe. CONTACT INFO You can contact me here and send a request for your special Drum Your Dream Drum Circle, Lessons, Drum Party, Team Building and more.